Each vintage wedding stamp is available in three sizes and all denominations. 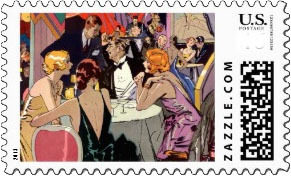 Click any stamp for a closer look. 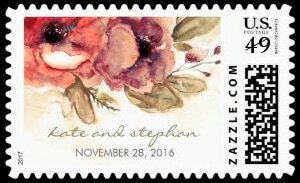 Old fashioned bouquet of daisies and pink roses with a hint of purple fill this vintage wedding stamp. The text Love in a cream colored banner below. 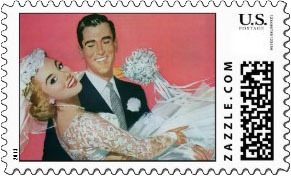 Retro wedding stamp with a smiling young bride being carried over the threshold by her dashing new husband. The pink background keeps the focus on the bride and groom. 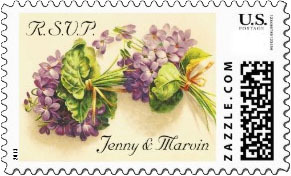 Victorian wedding postage with a watercolor painting of two bouquets of violets. Easily personalize with your names. Matching Invitations, RSVP and more. 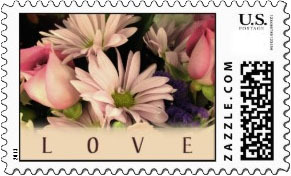 Vintage wedding postage stamp of love and romance. A happy, smiling bride in her wedding dress and her flower girl. It's time to go get married! 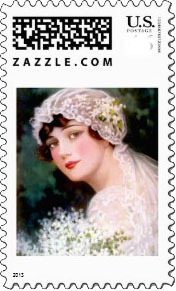 Truly a lovely vintage wedding stamp with a circa 1915 color illustration of a bride and her bouquet. 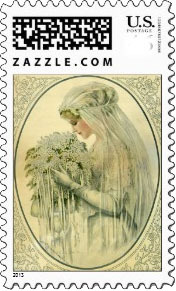 Victorian wedding stamp featuring a profile bridal portrait. The beautiful bride is dressed in an antique wedding gown with a veil and holding a floral wedding bouquet of cream colored flowers. 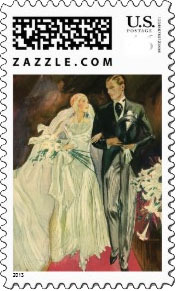 The illustration on this vintage wedding stamp shows the bride and groom walking up the aisle after the wedding ceremony. Groom in tuxedo and the bride in a white wedding gown carrying a bouquet of calla lilies. 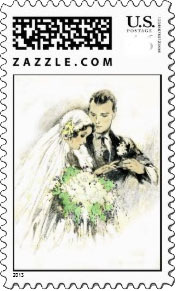 A simple and lovely vintage wedding postage stamp with a color illustration of the groom putting the ring on the bride's finger. Soft colors work with any wedding invitation style. 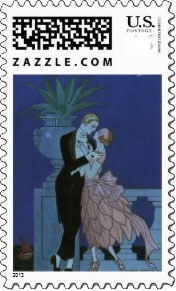 An art deco wedding stamp of the bride and groom. She is in an elegant wedding gown resembling flower petals with the groom in his finest tuxedo. Stylish. Retro and swirly stylized image of the bride and top hatted groom walking up the isle. 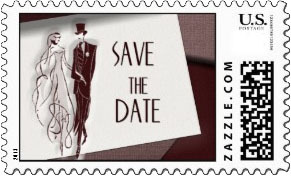 A very classy vintage wedding stamp for your Save the Date mailing. A romantic bridal bouquet in watercolors. Your names blow in a script font along with your date. 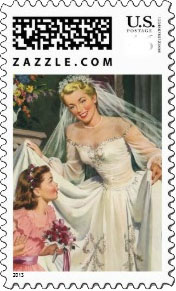 A loving vintage wedding stamp that fits any bridal mailing. 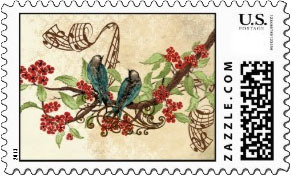 Vintage singing blue love birds on a cherry tree branch are the feature on this colorfully detailed wedding stamp. This colorful vintage wedding stamp is centered on a table of wedding guests in vintage clothing having a grand time.